Standing up to Izmir Governorate’s ban, people who stand against homophobia and transphobia marched from Kıbrıs Sehitleri to Kordon in Izmir, protesting the ban. The Izmir Governor’s decision to ban Izmir Pride March on the grounds that it “received intelligence that there may be propaganda for terrorist organization” was protested. [Organized over social media] anti-homophobia and transphobia crowds met at 19:00 at Alsancak Kıbrıs Sehitleri Avenue to Kordon seaside. Police set up barricades against the anti-homophobia and transphobia crowds holding rainbow flags. Police announced “disperse” and the crowd shouted “homophobic state, we’ll topple you of course”. After a short wait, the marchers headed the opposite direction towards Kordon seaside. More than one hundred people marched and chanted “Love, love, freedom; keep hate far”, “Tayyip run run run, the fags are coming”, “Don’t be silent, shout, there are gays”. They screamed against homophobia and transphobia. They condemned the homophobic ban of the Izmir Governorate. During the march, there was a sit-in at the shore. 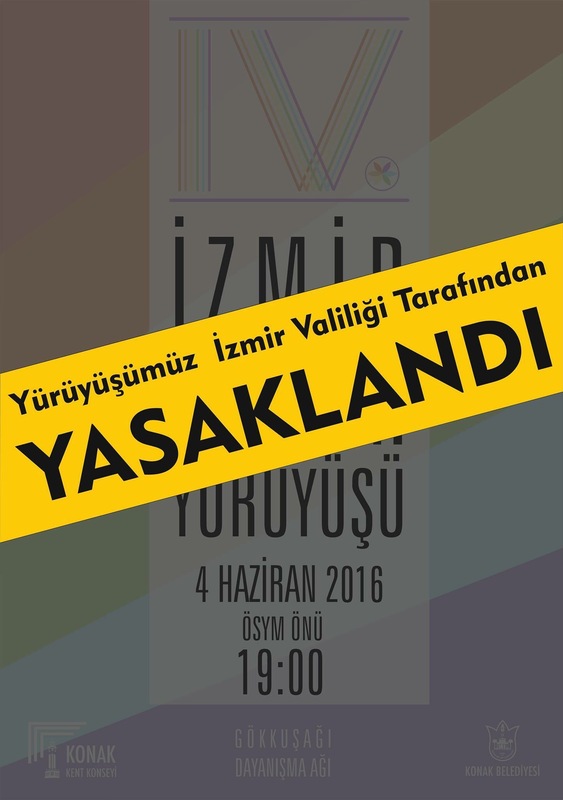 Izmir residents were invited to the press conference to be held on 6 June at 11:00 in Konak City Council to condemn the ban on Izmir Pride. The demonstration to protest the Governorate’s ban using “terror” as its basis found support from businesses around Alsancak and people in the area.